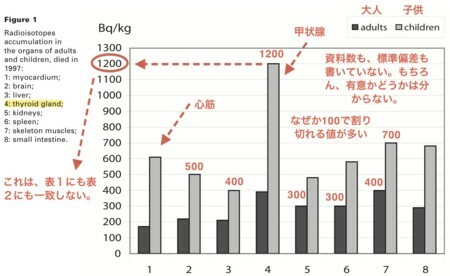 Biological effects of 137CsCl injected in beagle dogs. Biological effects of 137CsCl injected in beagle dogs of different ages. Radiat Environ Biophys.2010 May;49(2):239-48. Epub 2010 Feb 16. 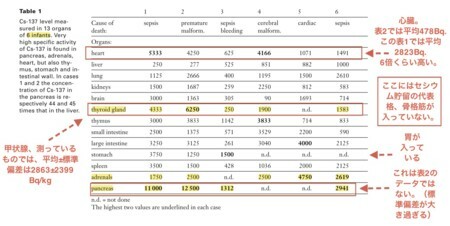 Biodistribution of (137)Cs in a mouse model of chronic contamination by ingestion and effects on the hematopoietic system. 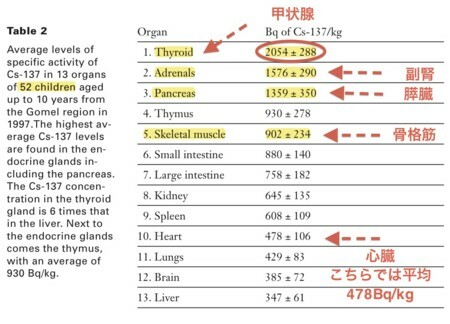 *1：The highest accumulation ofCs-137 was found in the endocrine glands, in particular the thyroid, the adrenals and the pancreas. *2：For reasons of economy the annual sanatorium stay has been shortened, and communities in some contaminated areas have been classified as “clean”, thus ending the supply of clean food from the state.